It’s Thursday, July 19, 2018, and National Daiquiri Day. I like them but find most too sweet. Ernest Hemingway consumed them by the dozen; here’s his recipe. On July 19, 1553, Lady Jane Grey, after having reigned only nine days as Queen of England, was replaced by Mary I and then executed for treason. On July 19, 1848, the famous Seneca Falls Women’s Rights Convention opened in the eponymous New York town. On this day in 1900, the first line of the Paris Métro, Porte Maillot–Porte de Vincennes, was opened to the public. Exactly three days later, Maurice Garin won the first Tour de France. On this day in 1947, the Prime Minister of the shadow Burmese goernment, Bogyoke Aung San, who brought independence to his country, was assassinated. His daughter is Aung San Suu Kyi. On this day in 1976, after I had already hiked in the region, Sagarmatha National Park, home of Mount Everest, was created in Nepal. Finally, on July 19, 1979, the Sandanistas overthrew the Somoza family government in Nicaragua. Notables born on this day include Samuel Colt (1814, of revolver fame), Edgar Degas (1834), Lizzie Borden (1860) and llie Năstase (1946). Those who fell asleep on this day include Syngman Rhee (1965; first President of South Korea), Lefty Frizzell (1975, great wearer of fancy cowboy boots) and author Frank McCourt (2009). 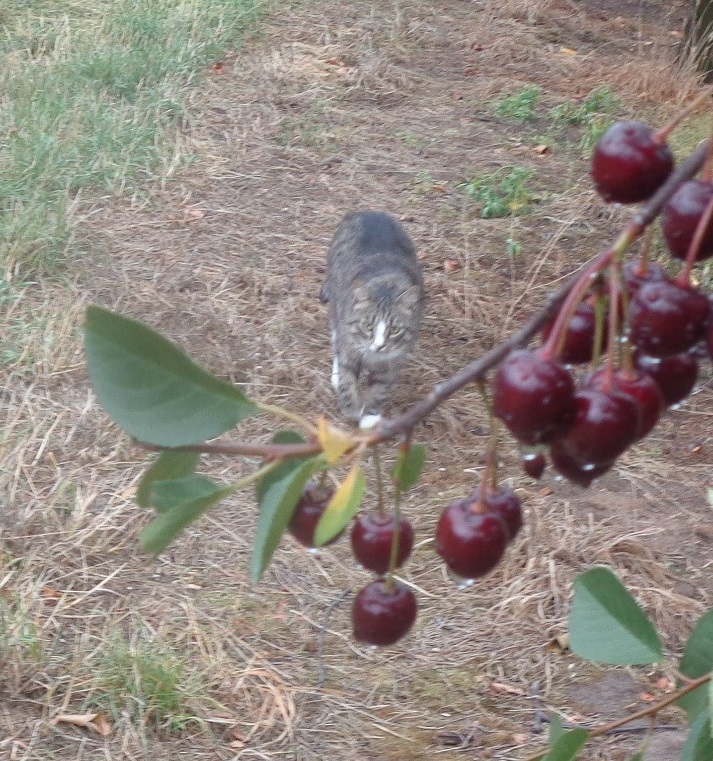 A: Do you think these cherries will be good for a pie? Hili: They are too wet. Look for some dry ones. Ja: Myślisz, że te wiśnie będą dobre na placek? Hili: Są zbyt mokre, poszukaj suchych. From the BBC, a cooperative pair of tropical birds. Again, sound up. Ain’t sexual selection marvelous. "Butterfly number 89 reporting for duty!"
. . . and a very hungry cat. Just to clarify, when I said "Thou shalt not commit adultery" I meant "Thou shalt not NOT commit adultery". People are missing the truly frightening part of this clip. Tucker & Trump didn't choose Montenegro out of a hat. Three weeks before the 2016 US election, Russia attempted a coup in Montenegro to keep them from joining NATO. This entry was written by whyevolutionistrue and posted on July 19, 2018 at 6:45 am and filed under Hili Dialogue. Bookmark the permalink. Follow any comments here with the RSS feed for this post. Both comments and trackbacks are currently closed. To be fair to Trump, I once went into a bank and meant to say ‘can I exchange these Euros please’, and instead I cracked the security guard over the head, held up the cashier and stole eleven thousand pounds. That kind of in-the-moment mistake can happen to anyone. 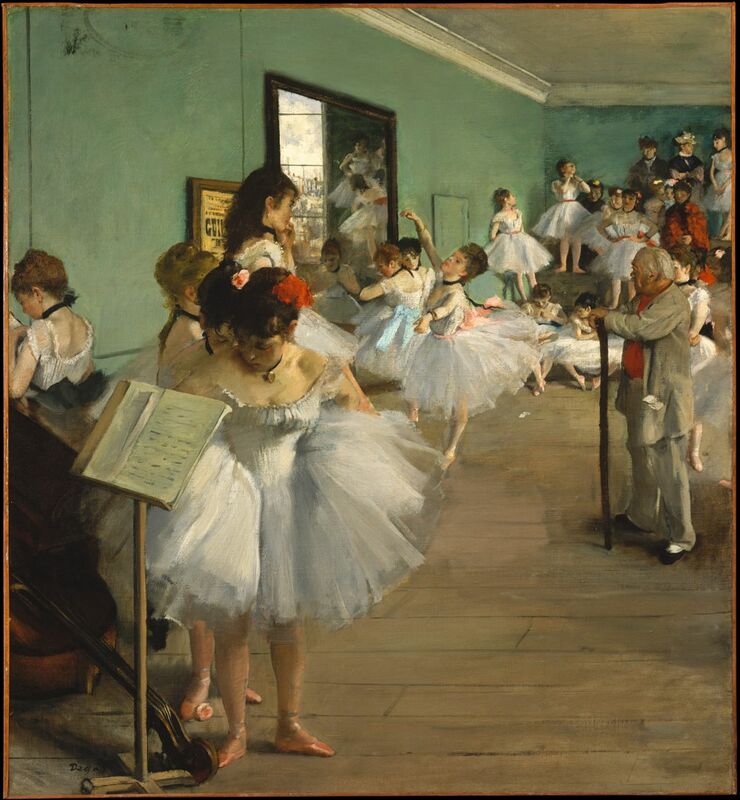 Degas’ dancing girls are all very nice, but where’s the cat? Where’s the cat? Maybe not with Degas’ dancing girls, but there were cats in the harem of Nasr ad-Din Shah, of the Qajar dynasty in Iran, who visited Europe in the 1870s (the first Persian ruler to do so) was so taken by the tutu that he started (or perhaps imposed) a fashion trend and had the women in his harem wear tutu-like skirts, frequently accompanied by white knee or ankle socks and shoes, which made for a a loopy, bizarre proto-bobby soxer style. Here are some photos taken by the Qajar Shah himself of his harem and his fetching favorite, Anis a-Dawla in her tutu https://en.dailypakistan.com.pk/viral/mark-done-no-body-shaming-this-photo-of-a-beautiful-queen-who-was-loved-dearly-by-her-king-shows-how-beauty-standards-have-changed-over-time/. One photo has a cat in it, and I read that the Shah loved cats and was quite despondent when his favorite cat died. Ernest Hemingway consumed them [daquiris] by the dozen. If memory serves, Papa claimed credit for creating the mojito at the Hotel Florida in Havana — hell, maybe even the Cuba libre, too, quien sabe? Have had my share of rum, but never tried any of those drinks. In the part of Louisiana where my daughter now lives, many of the liquor stores have drive through daguiri lanes–something I do not understand. And why? Same old answer: Follow the money. The Russian oligarchs hold the great majority of Drumpf’s paper. And who knows what-all else they have on Drumpf? This is getting close to treason if it hasn’t already crossed the line (likely). The Russians do seem to have something on him; he’s just pathologically incapable of saying anything critical of them, even up to the point of comparing his own country negatively with theirs. His psychological motivations are interesting too. He’s a tempting case study because he doesn’t seem to have an internal layer that’s hidden. Everything is visible, so some fairly strong conclusions can be drawn. Any of one these characteristics in a person is enough to set off his dislike. And I think the reason he hates these kind of people is because he has spent his _entire life_ trying to gain access to their inner circles without success. He has none of the above ‘entry requirements’, and is frustrated that his wealth hasn’t automatically granted him membership. He has always been a C-list celebrity, and he knows it, and every time an A-lister snubbed him, or jokes were made about his tackiness, he grew to hate the ‘liberal elites’ even more. Everything he does is driven by this resentment. You can see this in those rare moments when an A-list celebrity says something nice about him, at which point he turns into an oily sycophant and starts saying how wonderful they are. He craves it so much but deep down he knows he’ll never get affirmation from the A-list world of politicians, actors, writers, etc., because he’s not one of them. He’s talentless in all the ways that matter: he’s not witty, he’s not clever, he’s culturally illiterate, he’s never read a book, his favourite film is Kickboxer with Jean Claude Van Damme. If any member of the glitterati were to engage him in conversation at some swanky do they’d think he was mentally subnormal. This is partly why his fans love him so much – it’s the one crucial connection they share with him even though he’s a billionaire and they’re ordinary citizens. They share his resentment at this world of urbanity, intellectual self-confidence, etc. that is represented by people like Obama, Anderson Cooper, Hillary, Justin Trudeau, Jimmy Kimmel etc. – they will never really be a part of this world, and neither will Trump. He is motivated by his hatred of that world and simultaneously he is motivated by a desperation to prove himself to those people too. His supporters feel the same way, and he is their avatar that will sock the elites in the jaw for looking down on them for so long. To me this resentment explains the majority of Trump’s hostile interactions. I actually think it’s genuinely possible that Democrats could draw him over to their side over the next couple of years if they just started ceaselessly flattering him and inviting him to A-list parties. I think he’s that desperate for affirmation. I think it’s possible ISIS** could draw him over to their side if they started ceaselessly flattering him (though they might have some trouble arranging the parties). The question is whether the Dems could ever be so morally bankrupt and self-destructive as to want to. Brilliant. ISIS dinner-parties – there’s a sketch in there somewhere. ISIS could probably lure him to their side with a harem of Yazidi virgins. This is exactly right. Trump is viewed as a buffoon by the very group he wants desperately to be a part of. He has never been taken seriously by them, and it’s like he’s saying: “Do you hear/see me now?” It’s pathetic really. Unfortunately, thanks to the republicans, it’s not just pathetic but dangerous. Interesting analysis but your conclusion is off. He may be desperate but not for inclusion to democratic ideas or the A-list whatever that is. This demented mental case is back at it this morning speaking directly to his moron base and Fox news stating the FAKE news (everyone but fox) is attempting to start a war with Russia. Yes, they want a war with Russia and that is why they are being mean to him and Putin. It is all lies and he is too smart to fall for it. I would conclude that he and his followers are not worth the trouble of rehabilitation. If you are willing to degrade yourself and your reputation and character to get down in the mud with him, you cannot fix that. All you can do is run over it. Where in any of what I wrote did I give the impression that I would want us to toss all our liberal convictions down the well in order to get this repulsive slimebag on our side? I only said I think it’s conceivable that if the entire liberal world suddenly started massaging his ego he’d flip to their side. It’s not possible in practice, and it’s not desirable either(I’d rather lie down on traintracks than do any of that). It’s just a thought experiment, I don’t expect to get snarked at for raising it. And I think my conclusion is sound. He is desperate for inclusion to the A-list. It’s been one of the only defining characteristics of his absurd life, from his pretending to be his own PA in order to convince tabloid gossip rags that he’d been dating Madonna, to the constant, pathetic commenting on celebrity affairs that took up most of his Twitter feed before he became POTUS(cf. his weird intrusion into Robert Pattinson and Kristen Stewart’s relationship). As for the idea that his aversion to democratic ideals would preclude the possibility of him swinging towards the Dems: I think the fact that he was apparently a Democrat for a large portion of his life gives the lie to that. He’s a vicious, vacuous dimwit; he has no inherent political commitments. That’s precisely what never-Trump conservatives like David Frum and Andrew Sullivan identified in him. He’d go anywhere that satisfies his egotistical cravings. He’s not a social conservative or a liberal or a libertarian or anything at all. He’s too ignorant to even know what any of those terms mean. He’s an insecure bully with fascistic leanings, and he’s not motivated by politics in the normal meaning of the word. He’s motivated by a kind of pathological resentment towards his betters. I will simply answer you’re question placed at the beginning of this already known comment. You ended your first comment with the answer to your question in this comment. Spend the next two years with flattery and invitations. Really? Give me a break. I have no idea what you’re talking about. You’re talking gibberish. Odd…I thought it was English. And as Sam Harris describes him: A malignant narcissist. I think I can agree with most of that, well put. However, there is this important factor which you don’t mention: the Russians have Mr Trump by the balls -and he (probably) knows it. Note that Mr Putin’s task in the KGB included ‘turning’ Westerners, compromising them, blackmailing, flattering and psychologically leading them, the ‘package’. The fact that Mr Trump has such a narcissistic, vain and recognition-craving personality, and being bankrupt, made him an easy target. I think the idea of running for president itself might even have originated with his Russian ‘squeezers’ (cf the ‘our boy’ email). Yup, that might be the case. I have the feeling that the Obama White House press dinner thing, where Obama made fun of him in front of a roomful of journalists, probably had a part to play too. If you watch the footage you can see his mean little mind gearing up for battle. I don’t know which is worse – that he’s a Russian asset, or he’s doing all this because he’s just _that_ petty. Agree. Obama went too far over the line. I thought so at the time as I watched it. This is not s good idea. And here we are. But Obama had reason to dislike Trump, and Obama is not perfect either. I don’t think he went over the line. It was a white house roast, that’s what they’re like, and furthermore Obama was talking about the same man who’d spent years spreading repulsive, racist conspiracy theories about him. Obama was measured and no harder on Trump than he’d been on anyone else that evening(including himself with his many self-deprecating jokes). Trump reacted badly because he’s utterly incapable of laughing at himself on any level. The reason I say it might have motivated him to run for office is because he’s so incredibly petty and thin-skinned. You seem to have a slightly skewed view of liberal-conservative relations, rather like the way some people on the left talk about Muslims: they believe Muslims have no responsibility for their actions, they’re just blameless automata who can’t help responding to ‘provocation’ and you appear to think about Trump and his supporters along the same lines. I think it’s a combination. Partly, he is just that petty. He’s incapable of complex analysis. He can be persuaded into a pov by anyone prepared to take the time to flatter him and otherwise pander to his ego. We often hear him coming out with white supremacist talking points, or Russian talking points, or (whoever he was last talking to) talking points. With Russia there’s a slightly different combination. Putin must have something on him. I was reluctant to make that assumption, but I think it’s got to the point where there’s no other explanation for Trump’s behaviour (esp. failure to criticize Putin). Putin is using persuasion, flattery, and a very big stick. Trump is also getting a significant amount of support from those in the US who want closer ties with Russia because they see her as the guardian of white Christian conservatism in Europe. We don’t see them in the news, but don’t forget the weekly evangelical prayer meetings in the Oval Office. Russia does seem to be the new fatherland for a lot of white nationalists and general fascists. They like the direction it’s going in. Some of them even say they’ll drop Trump if he turns on Russia. There’s a third leg – Netanyahu’s Israel. He has also been cosying up to Putin. It’s quite funny really – while on one hand the white supremacists are worried about conspiracy theories of Jews ruling the world, otoh they’re relying on them as a conservative white stronghold holding the “Muslim hordes” from the door. It would be laughable if they hadn’t managed to get into so many positions of real power. All the things they accuse the Dems etc of doing re a deep state, they actually are doing themselves. There’s very little doubt that the Russians are, in fact, holding all his paper. The US banks deserted him a long time ago: Based on his serial bankruptcies and erratic behavior. Putin’s lust, aside from sheer power and wealth, is to go down in Russian history as the guy who rebuilt Russia’s great empire. As I said, this is very close to treason, and I think has almost certainly crossed that line already. People assume that Putin-Drumpf tete-a-tete was in the interest of the USA. Ha! Approximately zero percent chance of that. It was Putin reminding Drumpf of his grip on him. @Saul I agree with your analysis of what drives Trump. His set of drives are nearly all negative – reacting resentfully by lashing out without forethought at ‘properly’ successful people & at institutions that don’t bend to the will of The Chief. He is far from being a billionaire though! Much of his cash flow depends on his brand licensing which is a here-today-gone-tomorrow intangible asset. A lot of ‘Trump’ property is just labelling or likely heavily silent partnered e.g. his Mar-a-Lago estate – he [or Ivanka] probably solely owns the part of the building where his quarters are & the club/spa, but the rest of it likely not. The reason I think that is Trump has always had cash flow problems due to his careless business ways – any solid assets will have been mortgaged & remortgaged or sold [retaining branding only] long ago. A side note on his ‘base’: I think his base are more varied & complex than you suggest – we only see the extreme elements at his monthly rallies [he loves his rallies! ], but a mostly silent portion voted Trump because his lies offered them the only opportunity they could see to achieve the American Dream: success to all those who are prepared to work for it – even those living in under-resourced, forgotten, small communities built around dying industries [coal, steel, hardware manufacture, textiles, footwear, automotive, farming of less than 1,000 acres, indie local newspapers, indie ‘mom & pop’ retail, indie gas stations]. Most of America, by area, is ‘hinterlands’ – they resent being ignored by all the forces that they think [wrongly] could breathe life back into there depopulating, drug & drink ridden towns. Der Drumpfenfuhrer is a 12-year old boy who the cool kids wouldn’t let play with them, despite his rich Daddy. And he’s been playing that out ever since (and he’s still 12). Terrorism is social disorganization evoked by terror; Trump is social disorganization induced by narcissistic incompetence. Sadly for U.S.A., Russia was successful this time. I think we may be approaching an inflection point with Trump (as the pundits are wont to say). All this fumbling and bumbling around is starting to show just how far Putin has his hand up Trump’s keister. The only remaining question for now is – will this guy even make it to the next election. Will living in Moscow be any better than living in NY. Sorry to hear about the weather in Poland. It is either too wet or too dry for the farmer. Hili will eat less pie. Hmm, if I was going to be exiled from NZ, Moscow would be one of the better cities to live in, I think. Paris would head my Top Ten cities, but Moscow would certainly be on the list. (Just based on a few days’ visit, of course). I can’t rate New York, never been there. Yes well, I was not mentioning Moscow as a retirement villa for you. Just a suggestion for Trump after he is removed from office here. His neighbors over there might be a bit more friendly and his current NY natives are not really keen on him. Ummm, I’m sure you didn’t mean it that way, but I doubt Muscovites would be any more tolerant of tRump’s idiocies than New Yorkers are. (I don’t think you meant to imply that Russians are more friendly than ‘muricans, either). in my short visit I found Muscovites perfectly friendly, and Moscow is a very pleasant city. I guess I was just reacting to the fairly common implication that living in Moscow might not be very pleasant. I can think of a whole swag of provincial industrial cities (in almost every country) that would be far less pleasant. You are correct. Reading far more into my short comment than was every there. You act as if I was insulting Moscow? Where do you get this? I said ‘the fairly common implication’ – I certainly didn’t mean to say that you made it. Can we drop it now? Yes, I’ve only seen Moscow in spring, and it’s a lovely city. The climate would be my biggest reservation. I guess with tRump’s purloined $$$, he could afford a modest dacha on the Black Sea for the winter months. This is, of course, assuming Putin would allow him into the country. I wouldn’t. Should have gotten in c. 1988 when my cousin Vance went to the SU- he almost bought a lake side property somewhere (mansion style – it “belonged” to a local official of some renown) for $100. Trump is likely more guilty of treason than Benedict Arnold. Arnold was attempting treason but never completed the deal. Trump has completed it in spades, even offering up Americans for Putin to question in Russia. Also Trump took an oath to protect and defend the Constitution, not stomp it into the dirt. Aid and comfort to the enemy by the president of the U.S. It only takes two witnesses. Let’s be patient. November is not that far away. You left the initial “I” off of Ilie Năstase’s name. That bit of the Tour de France is across the Lac de Roselend dam (as per the title) and presumably then over the Cormet de Roselend towards Bourg St Maurice. A charming drive, over a rural mountain pass, in mostly wooded hill country, though often infested with bicycles. Only a few kilometres to the north-east are the high mountains of the Mont Blanc massif. It’s actually the shortest route from Bourg towards Chamonix, though far from the quickest. Not one of the precipitous passes, it rates about 3 on my 0-10 scary scale. I watch every stage of the Tour de France every year, though I do pre-record it and do a lot of fast forwarding. The beauty of the French countryside is amazing! Do you sell DVDs of the results? I watch DVDs of the Tour during my treadmill workouts. (I have 1978-2017!) Last year I had to opt for a Japanese BR. Which had excellent coverage and I could read the French titling and the Japanese commentary (which I do not understand) is pretty funny to listen to. No DVDs. I record it on my DVR from NBCSN, NBC’s sports channel. Yesterday’s stage on Alpe D’Huez was very exciting, though I was sad to see a major rider taken out by some idiot spectator’s camera strap catching his handlebars. Trump says he’s bothered by provisions of NATO that require the US to come to the defense of other member countries. Trump does not know what Nato – or nuclear weapons – do, nor does he care. Luckily, both cost money, or it would be more than Trump’s pants that would be on fire. NATO has been active in Afghanistan for 15 years and during that time suffered about 3500 military deaths, or about 5 soldiers a week since the occupation began. Around two-third of the losses are Americans. To date the war in Afghanistan has cost the US something around $1 trillion. It may be more like three million. That is more taken away from developing our military capacity and infrastructure at home. We needed that money to maintain our superior weapons advantage over Russia and China. We may have lost that advantage. I think it would be difficult to convince anyone in your military advantage if you let guys from Afghanistan organize terror acts in your cities with thousands of victims. The alternative would be to just let Russia take over all the countries it wants. They would not have taken Crimea if Ukraine had completed their membership process, which was stopped by Putin puppet Viktor Yanukovich. I consider Article Five the only thing keeping the Baltic states safe from Russian invasion. The attitude Tucker Carlson and Trump displayed about going to the rescue of Montenegro was sickening. NATO membership means no one has to go and fight. Non-membership might mean no USians going to fight, but it also means Montenegro being taken over and some of her people being murdered. Of course, I’m sure Trump and Carlson consider them less important than USians. Did you hear him during the campaign when he kept saying America first. I think he meant that and his supporters meant it also. America first is just another simpleton’s way of ignoring all responsibility. It also gears up the Trump followers who also have no attachment to anything. It is hollow and means – Trump first. If it is good for Trump’s pocket it is good for everyone. This is all around him and covers him up. His business, his hotels, his golf courses and his financing – Russia. The idea that he is for American is a joke that only his morons could believe. Give these republican farmers all over the Midwest a call and see if they continue to buy this America first crap. I saw one interviews on tv last night. He said he still does. The polls say most all of them do. You are out of touch completely with Trump supporters and what they think. I am writing these post to try to wake you and others like you up before it is too late. Stop insulting me with this wake up call. No one here is needing a wake up. I am simply defining for you what this America first junk really is. You are just repeating a political call with nothing behind it. I am defining it for what is really is. You said above he said America First and he meant it. His supporters mean it too. Okay, what does it mean? I thought you did not want me to insult you with my advice. I will honor your request. I don’t think he understands how to make the US first. Even the short-term economic gains will lead to long-term problems, and several actually the result of Democratic party moves from the previous administration. Like pretty much everything else he does, America First is mostly smoke and mirrors or, more accurately, bullying and tweets. Trump has no social skills and absolutely no diplomatic skills. Watching him is like watching a horror movie or having a nightmare that just won’t end. At best, he has the intent to reduce tensions with Russia and to reduce the expenses of defending Europe. The execution of that plan is to use his words a disaster. I have been tracking his poll numbers. They are stable in the low forties and have been for most of his term. Here in Georgia all the Republicans for statewide office are trying to outdo each other as Trump supporters. The most pro Trump will be elected. That is the current state of affairs. The votes are not there to remove him from office. Maybe things will change in the next two years. I am sure you do not need me to tell you that Georgia is not a mirror of many other states. Things are changing fast in many places and I do not think you need to wait another two years. We will see. There is an election coming up in a little more than three months and we will know much more after that. Yes, Drumpf will lose the great majority of independents who voted for him in 2016. Many votes for Drumpf were anti-Clinton votes. Drumpf won based on about 80,000 strategically placed votes. Think he still has those votes? I can only hope the Dems are motivated to get out there and effing vote! If we vote, we win. We outnumber the assholes. In a few places, the most pro-Trump candidate will win the primary but lose the main election to a Democrat that can turn their Trumpism into a liability.